WSM reporters took part in the student march against Garda Brutality in Dublin called by Free Educations for Everyone and the Students in Solidarity networks. Over 600 people took part in the demonstration which marched from the Wolfe Tone statue to Pearse street police station. 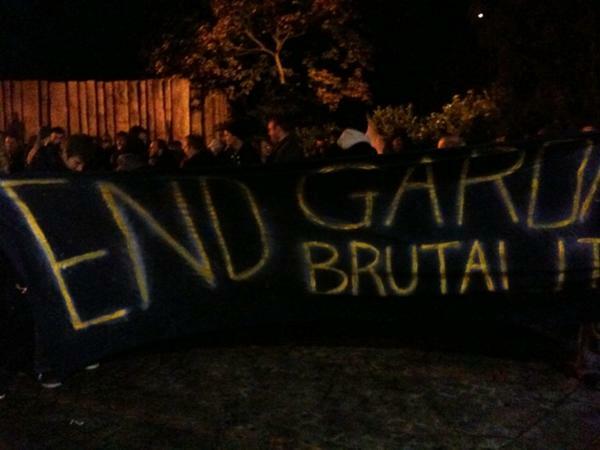 It followed on from the previous Wednesdays Garda attacks on students protesting the planned increase in fees. 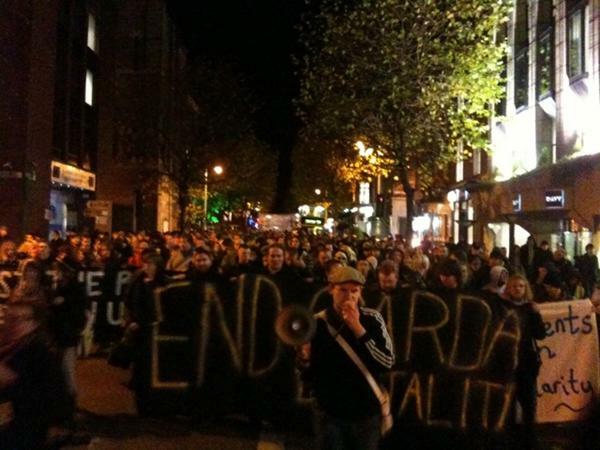 We had provided live coverage from that protest as the Garda attacked the students with horses, dogs, vans and batons and we again provide live coverage from this protest which is archived here. Lorcan Myles a spokesperson for the organizers of the demonstration and an eyewitness to last weeks events described how "Students sitting on the road in protest were baton charged repeatedly by Gardaí, with many suffering injuries. One female student was knocked unconscious during the assault on the crowd, and other students clearly displayed head injuries. “The Gardaí rushed the crowd on numerous occasions, including spectators on the street." Pro government voices in the media and online had tried to frighten people away from the demonstration by predicting 'violence.' This failed to scare off the 600 plus who took part but it was noticible that many arrived late or only joined the march after it had progressed a couple of hundred meters. In reality such forces always make 'violence' predictions when protests against Garda violence are called but every time these 'predictions' are proved false. The spirt of the demonstration was angry and determined but it was also disciplined with individual uniformed Garda allowed to pass through the crowd. The whole event was organised by rank and file students who had been attacked the previous week, there was no input from the student unions and the only declaration of support came for the IFUT teachers union branch (link below) in one of the colleges. Student leaders and papers had largely joined in the chorus of trying to blame the students for the Garda attack as part of an agenda of trying to marginalise the growth of radical ideas in the student movement. This growing division between radical students and their supposed leaders was reflected in the speeches at the end when the one student leader who did speak seemed to be trying to suggest the Garda had been somewhat provoked. This resulted in loud and prolonged mass heckling, as was the attempt by Des Bonass, the Dublin Council of Trade Unions speaker to congratulate the Garda for their good behaviour that evening and to suggest they should be considered to be 'workers in uniform' subject to the same cuts as public sector workers. He had told indymedia.ie in advance of the demonstration that "I believe last weeks actions from the Guards are coming down from a higher authority to keep people off the streets." and afterwards he explained that "I was just trying to get the Guards to come over to our side." Both illustrated the profoundly political nature of the demonstration despite the lack of party political banners or flags (at the organisers request). Members of Workers Solidarity Movement, the Socialist Party, Labour Youth, Socialist Workers Party, éirigí, and the 32CSM were present and one WSM reporter had a mainstream journalist who had mistaken him for a fellow hack point out individuals in the crowd with great excitement. The other political aspect were the links made with previous Garda violence in Rossport in Mayo and in the north inner city. Student union leaders, many of whom are members of the ruling party implementing the cuts, are working hard to marginalise the radical left as illegitimate in students eyes yet it is very clear that students need to rapidly develop the ideas and organisation that can take the conduct of their struggle out of the hands of these conservative leaders who are not capable of fighting the fee increases. 19.26 - It's all finished up now. Thanks for all the retweets! 19.15 - "Final speaker - we will be back on the streets on budget day"
19.14 - "Another student - nothing wrong with engaging in peaceful protest, we sat down and were attacked - this was a reaction it was a state reaction to the anger out there"
19.12 - "There are shouts of remember Terence Wheelock from the crowd - the speaker says we will stay on the streets". Terence Wheelock was found unconscious in a garda cell after being arrested. He died in a coma. Previous WSM articles on this issue. 19.11 - "Maynooth student speaker who was in the occupation says those inside the occupation were kicked and beaten by Garda as the sat on ground"
19.10 - "NCAD vice president speaking, he is getting heckled for saying Garda were over reacting but had been provoked, seems to be wearing a fur coat, at the end of his speech he got a cheer for saying he wasn't apologetic about the occupation"
19.00 - "Des Bonass ends by declaring that "you have our support", that gets a big cheer, next speaker is a former USI and UCDSU officer, he says this is not just a student issue but is about democracy"
18.58 - Clarification on the union-booing. "Des gets booed by students for congratulating Garda for being well behaved tonight, bit of a miscalculation in these circumstances!" 18.57 - Odhran reports that "first speech from a student knocked unconscious by the cops last week." 18.53 - Gavin Sheridan of thestory.ie rpeorts: "union speaker getting booed"
18.52 - "About 600 - now down at pearse st cop shop" Decent looking crowd. 18.37 - Our source is relatively moderate with the numbers: "Crowd closer to 300 now. now coming up to trinity college"
18:27 - "Speeches begin, crowd chants "whose streets, our streets!". Speaker at at start declares that "we will not be beaten off the streets"
18.12 - It's just under 200 gathered at monument, atmosphere good, march starting soon. 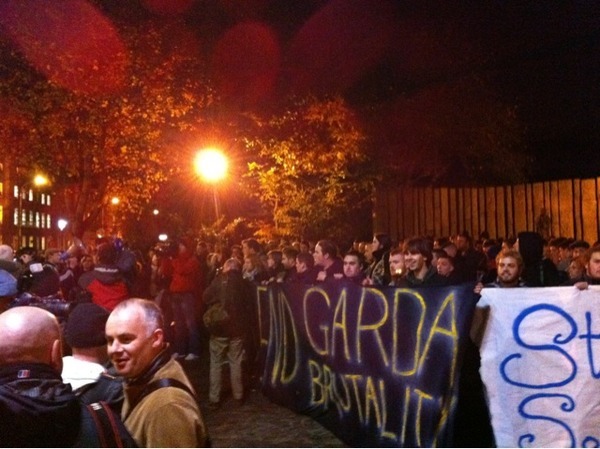 18.04: Odhran reports: "About 150 to 200 assembled at the statue at the moment"
Student Protest against Garda Violence from Dave Donnellan on Vimeo.